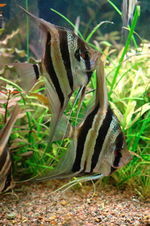 Please copy and paste ' [[Category:Cichlids (American)]] ' into the end of your article to include it in this category. Central and South American Cichlids vary greatly in size, from 2.5cm (1") to over 40.6cm (16"), colour and temperament. They do tend to have more pattern and slightly more muted colours than their Rift Lake African cousins however. In terms of temperament, there are indeed some more mild tempered Cichlids found here, including some which will work in a carefully selected community set up such as Angelfish. There are others, such as the common Oscar which are better off in species set ups, even kept one to a tank alone. The most well known South American Cichlids originate from the Amazon and prefer dimly lit spacious tropical tanks. Whereas Central American Cichlids are a little more varied, often preferring cooler temperatures. See here for a list of cichlid common names. Pages in category "Cichlids (American)"
This page was last edited on 26 August 2015, at 15:53.